About as useful as a screen door on a submarine: A sarcastic expression implying that something or someone is not useful at all, like those signs that read “Danger Low Flying Aircraft” … or that a situation is dangerously irresponsible (like the timing of the GM ignition-switch recalls). This expression is not to be confused with Don’t let the screen door hitcha on the way out… which implies that the addressee better be departing immediately. It’s that time of year again, when everybody’s schedule becomes a whirlwind of deadlines and obligations. From parents’ tax-filing deadlines and end-of-season committee meetings to children’s standardized testing, recitals and sports tryouts, we all need a stress break. But we need to maintain healthy eating habits. Don’t fall into the quicksand of drive-by fast food. Nothing fills the bill for family dinner during this busy season like one-pot main dishes. Think chicken pot pie, or tuna noodle casserole, or fancied-up macaroni and cheese, or beef stew. Couple the all-in-one dish with salad, fresh fruit and veggies to have a delicious AND healthful meal. This week, The Old Bride is serving up several recipes that might not be as familiar to our readers as some of the dishes mentioned above. But try them, and they soon will become part of the household repertoire. Many thanks go to my brother, Pat Daltroff, for whipping up and photographing the Coq au Vin recipe at his Palm Springs restaurant, Twin Palms Bistro & Lounge, during my visit this week. This is a hearty all-in-one dish for a hungry crowd. It is very adaptable to whatever cooking method and time frame the cook chooses. Serve with small boiled potatoes and a salad of mixed greens. Brown the chopped onion in bacon drippings or 4 T olive oil or salted butter. Add the ground beef and continue browning, stirring as needed. Add the bacon and ham and stir to blend. Simmer about 5 minutes and add ketchup, brown sugar, mustard, and Tony’s. While the beef mixture is simmering, rinse the navy and red beans and combine with the pintos and chili beans (use can sauce for both). 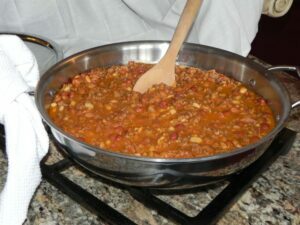 Combine the mixed beans, beef mixture, and water in a large Dutch oven or large skillet, and continue simmering on low heat, partially covered, for about 30 to 45 minutes. Stir occasionally to prevent sticking. Combine mixed beans and beef mixture in a large slow cooker and cook for 3 to 4 hours. Combine the mixed beans and beef mixture in large skillet, cover, and bake, covered, din oven set to 300˚F for about an hour. Yields about 8 hearty servings. This one-pot dish is as simple as it gets, but it’s tasty. It is so easy that you don’t even need to attempt a slow cooker version, although a short cycle (4 hours) in the slow cooker would work well. Fry bacon in Dutch oven over stovetop, just to brown. Sprinkle seasonings over chicken. Add chicken to frying bacon and brown on medium-high heat, both sides. Add onion and garlic, stirring and tossing. Cook 2 minutes. Drain grease. Add veggies and wine. Cook, covered, about 25 minutes, until potatoes are tender and sauce has thickened. Stir occasionally. Pour into serving dish or individual plates and garnish with fresh parsley.